18 June 2007, Toronto, ON, Canada - SWP, Inc. has introduced its new model of fast, two-cannel Universal Frequency-to-Digital Converter UFDC-1M-16. This IC is designed for applications requiring high conversion speed. In comparison with the previously model of UFDC-1 the new converter has increased up to 16 MHz internal reference frequency and decreased in 32 times conversion speed. The UFDC-1M-16 is based on patented advanced modified method of the dependent count for frequency-to-digital conversion. The IC has wide frequency range from 1 Hz to 7.5 MHz (120 MHz with prescaling), programmable relative error from 1 to 0.001 % at appropriate non-redundant conversion rate from 6.25 ms to 6.25 ms and three popular communication interfaces for sensors applications: I2C, SPI and RS-232. The fast conversion time makes the IC's speed comparable with successive-approximation and S-D ADCs. 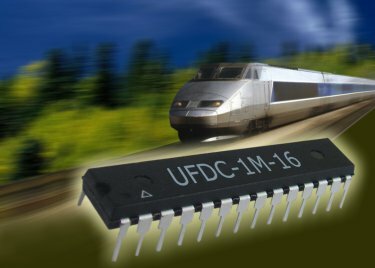 The UFDC-1M-16 is available in 28-lead Plastic Dual Inline Package (PDIP), compact 32-lead TQFP package and in a wafer form for embedded applications.